What’s the address to send my postcard to? What should I write on my postcard? As much or as little as you like. Some people don’t even write their names, other people write a lot about themselves, or the place their postcard is from. You can just write your name if you like. Can I send more than one postcard? Of course, you can send as many as you like. Can I send postcards inside an envelope? Can I send Geography Cat a postcard from a location which is already represented? Can I buy a postcard in one location and post it when I get home? Geography Cat is using the postcards to stimulate the Geography blog posts so it doesn’t matter much where the postmark is from. Sometimes it’s difficult to buy a stamp and post the card too, so he understands if you take it home and post it from there. Have you received my postcard yet? 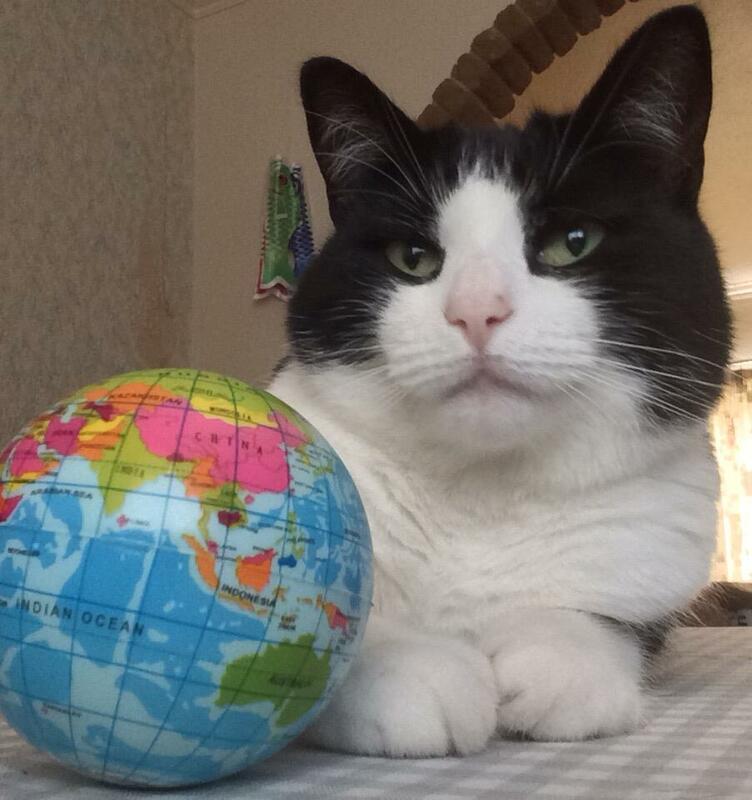 If Geography Cat has received your postcard it will be on the Paw Print Map. It usually takes a couple of days to update the map and each time it is updated Geography Cat posts that it is done on his Facebook Page. If you find the location of your postcard and click the paw print you will see a photo of your postcard. If I spot an error on the Paw Print Map, can I change it? Just let Geography Cat know and he will change it for you, he doesn’t intend to make errors but sometimes it happens. You have received my postcard, but there isn’t a blog post about it, why is this? It takes Geography Cat a really long time to do the blog posts, he can’t do them alone and his human assistant has a full time job, home and family commitments, that sort of thing. The wind has to be blowing in the right direction, and at the right time. However, every location will be written about eventually, that is his solemn promise. How do I let Geography Cat know if I spot an error in a blog post? Just email him at Geography_Cat@aol.com and tell him what it is, and which blog post it is in. Can I send Geography Cat a photo instead? Only if you have taken the photograph yourself, and if you tell Geography Cat the location. Then he can make it into a postcard for you. Alternatively, you could do that yourself with a postcard app. Can I send other things to Geography Cat, like a brochure from somewhere? You can, and it might be used in a blog post if it’s directly relevant to somewhere with a postcard, but it won’t appear on the Paw Print Map. I sent my postcard ages ago but it still isn’t on the Paw Print Map, what’s going on? Unfortunately, not every postcard makes it through the postal system. It’s a terrible shame but there’s nothing we can do about it. Geography Cat has alerted Royal Mail Customer Services that some cards have been lost. Why should I read the blogs? Because they are interesting and informative and it’s fun! Geography Cat writes them for you to read, so he’s always happy when you do. Can I write the blog post to go with my postcard? Yes, send your proposed blog to Geography_Cat@aol.com, clearly stating which postcard it should go with. Geography Cat reserves the right to editorial control and copyright. Where can I buy a Geography Cat button badge? What is Geography Cat’s real name? Is Geography Cat really a qualified geographer? Sadly not, but his human assistant is, she has a degree in geography, a post-grad certificate in teaching and another degree in marketing. She has taught geography for nearly 25 years, to students aged 11-18 years in schools located in the UK, NZ, and Colombia. She is a fellow of the Royal Geographical Society and she thinks about geography almost all of the time. Geography Cat has picked up a lot just by being close to her. It is expensive to run the Geography Cat website, blogs etc? The PO Box number is quite expensive, the Geography Cat postcards and badges are reasonable because they’re bought in bulk and last a long time. The running of the website and blogs also incur ongoing costs. However, it is all worthwhile to spread the love of geography so please do take a moment to read some of the blogs. What will Geography Cat do when he had reached his target of 1000 postcards? He hasn’t decided yet. He’ll probably just carry on, try to catch up with the blog writing, maybe make a start on his book. He has decided to keep the PO Box though, so you can carry on sending him cards. He loves every card he receives.